Several months ago, I was one of the unfortunate travelers who got caught up in finding out about Delta’s tighter restrictions on carry-on suitcases while at the gate. Despite the fact that I had been traveling with the same Jansport roll aboard suitcase for years and knew darn well that it fit in the overhead bins (wheels first), I discovered that it did not actually fit in the carry-on luggage size check frame at the gate—it was to thick and tall. After a short, measured protest, I was forced to check my beloved carry-on, sparking an Odyssean-like journey to find a new one that wouldn’t leave me standing at baggage claim at my destination. 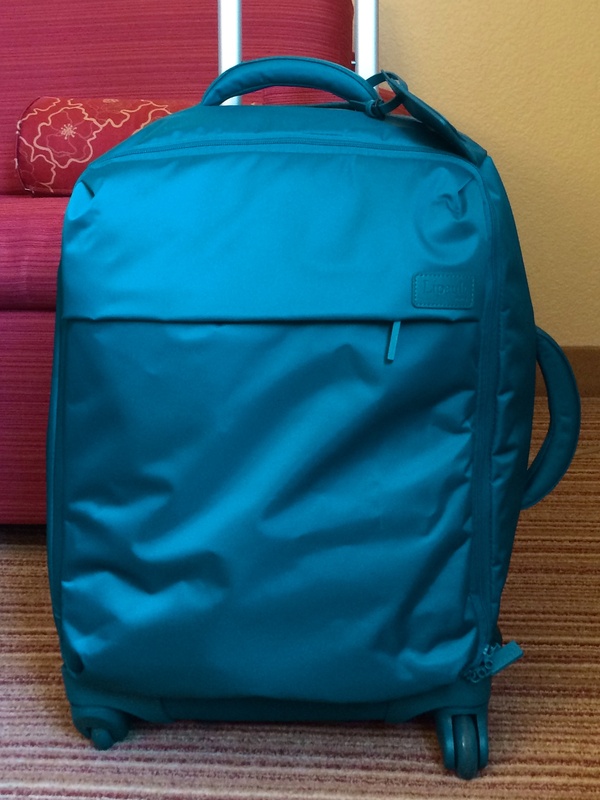 At first, I purchased a teal, four-wheeled Samsonite that was advertised as a “carry-on”. But standing that suitcase next to the one Delta had recently rejected, I discovered that the Samsonite one was, in fact, taller. After some investigation, I learned that they weren’t counting the wheel height in the overall dimensions. Major fail. Suitcase returned. Armed with a measuring tape, Delta’s dimensions (22″ x 14″ x 9”), and a high tolerance for kneeling/crawling/generally making a spectacle of myself in public, I went to a few stores to see what I could find. I was surprised. Out of the three that I measured in-store, none of them were counting the wheel height in the dimensions, and some had thick pockets on the front flaps. This is problematic, as those extra inches will make the suitcases not fit in the Carry-On Check Delta uses. Dejected (and dusty) from my measuring adventure, I turned to the trusty Internet. After scouring many “top” lists for carry-on luggage, I stumbled upon a brand that I wasn’t at all familiar with: Lipault. Their bags consistently got good reviews, and the dimensions (on paper) were a perfect match for the new carry-on requirements. I had some reservations (the biggest of which being that I never had a soft-sided suitcase); however, there was no way for me to see it in person, as no stores in ATL carried it. So, I took a gamble and ordered it online. When it arrived at my house the next day, my initial reaction was that this thing was SMALL. But I had to remind myself that it is supposed to be smaller than the bag I used to be able to carry on the plane. While it was technically a half inch wider than claimed on the website, I knew that the soft-sided nature of the bag would allow me some wiggle room. As luck would have it, I was leaving for a trip that day, so I unpacked my old suitcase and discovered to my great delight that nearly everything I had originally packed in my old one fit beautifully in the Lipault suitcase. I zipped it up and headed to the airport, confident that my quest for a new rolling suitcase had come to an end. And as I approached the gate to board that day, I knew I would likely never have to go through the pain of checking a bag at the gate. Lipault for the win. Check back later for my full review of the Lipault Paris 22” spinner–after it has some miles on it. Until then, I’m curious: do any of your have any great (or horror) stories about finding the perfect carry-on suitcase? Share them in the comments below! I’m shopping right now and finding all sorts of weird claims. I need to get one no larger the 19.5×15.7×9″! Some of them say they are 19″ but aren’t even that w/o the wheels! What happened to truth in advertising? Yeah. It’s so hard to find accuracy these days. I suggest heading to the store with a tape measure. I did. I ended up with a super expensive but very nice Briggs & Riley carry on. It is so small, I was sure there’d be no weight problem. But it packs so efficiently that in no time I was 2 pounds over the limit and didn’t even have it fully stuffed yet. Sheesh. Oh wow! Thanks for the update. I always try to wear my super heavy stuff to alleviate that issue. Happy travels!